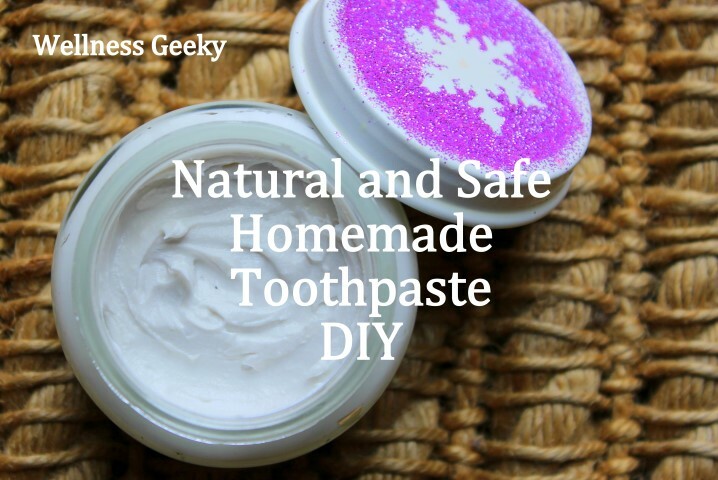 Homemade toothpaste is a great alternative to store bought versions. It’s cheap, effective and most importantly it’s safe. Safety of toothpaste started to matter for me the most when my older kid started to brush his teeth. As kids are tend to swallow some, if not all, toothpaste while using it. Do I want my kid ingest conventional toothpaste, especially one with fluoride? Definitely, NO!!! On regard of fluoride in toothpaste, I’m not against it per se. There is study based evidence about its protection against cavities and a decrease in tooth sensitivity, when applied topically. But I totally oppose water fluoridation and swallowing of any kind of fluoride. That’s why I have reverse osmosis filter in my kitchen (to remove fluoride from water) and homemade toothpaste in the bathroom. However, list of inedible ingredients are not limited to fluoride only, so I don’t feel comfortable about my kids swallow them during their dental routing. You can buy edible kids toothpastes, but they’re relatively hard to find, pricy and don’t give you any advantages compared to homemade versions. And don’t be fooled by conventional toothpastes, which marketed for kids. The only differences between those and adult ones are tubes with cartoon character and candy taste. Hopefully, by now you convinced that homemade toothpaste is worth to try. So here’s what you need for making one. Transfer to storage container of your choice. Empty cream jars and baby food jars are good choices for storing toothpaste. When brushing your teeth, dip your toothbrush in the jar or use an ice cream stick to put some of your toothpaste. If you prefer the first method, be mindful about hygiene, it's better that each member of your family had his own jar. N.b. This toothpaste formulation works the best for me and my family. It's possible that you will want to adjust this recipe to meet your needs. For example, I like to use a lot of baking soda as it gives me a sense of freshness for longer periods of time and my kid doesn't mind it. But some of you can dislike the taste, so reduce the amount you use in the recipe. Same about coconut oil; more you will add softer the texture will be, so find your perfect spot. Calcium carbonate – we have huge deposits of calcium carbonates on Earth, most of them are from shells of sea creatures. It’s the same type of Calcium, that used as antacid and as Calcium supplement. It’s totally safe and makes a nice base for toothpaste. Most commercial toothpastes contain Calcium carbonate as the base too. Baking Soda – helps to whitening your teeth and to keep germs’ growth in your mouth under check by normalizing pH balance. Extra Virgin Coconut Oil – helps to soften texture of toothpaste, so it’s not very abrasive. In commercial toothpaste glycerin is often used for this purpose. But many dental health advocates are against use of glycerin as it can form a film on your teeth, which interfere with natural re-mineralization of them. Plus virgin coconut oil has antibacterial properties so it also helps to control a bacterial growth in your mouth. Stevia and Xylitol – added solemnly for taste purposes, and are totally optional. Essential Oils – I highly recommend using therapeutic grade essential oils, as they are free of fillers and 100% pure. Good choices are Mint, Fennel, Cinnamon, Lemon, Lavender and other essential oils derived from plants which are used in food. Some oils with antibacterial properties like oregano and tea tree oils are also excellent for this recipe. Bottom line: After you try this recipe, you will never go back to conventional toothpastes.